Today is Bah! Humbug! Challenge day and I'm running even later than usual with my DT card after having a wee fight with black ice on Wednesday, whilst in Edinburgh. Unfortunately, I lost. 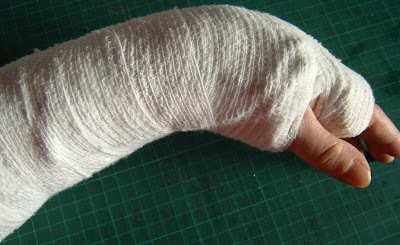 YESSIRREE - I broke my wrist ... *cue violins* ... LOOK! Amazingly, although I was obviously in agony, not one single person offered to help me up or collect my belongings, (which were strewn across the pavement). NOT ONE! Maybe they thought I was practicing some strange dance moves or something while writhing around in agony on the wet pavement, desperately trying not to cry, scream or swear - but they didn't applaud my performance so it can't have been that. It's a classic example of people not wanting to get involved I suppose. Anyway ... I eventually managed to gather everything together myself and got a taxi back to the dealership garage where our car was being serviced and they called an ambulance to take me to A+E. Apparently it was quite a nasty break - wrists aren't supposed to be 'S-shaped' - and although it's still quite painful, I did manage to make a card for this week's Stencil Challenge thanks to a steady supply of painkillers. I used the Fiskars Shapeboss, kindly given to me by my fellow Humbugger Ann when we were in York last February. As the design I wanted to use was on one of the small miniboss stencils, I could only use the orange pegs to hold it in place on one side. The other side was taped firmly to the board and the linen card was sandwiched between the 2 stencil sections. I then embossed around the design with the stylus. Easy Peasy ... Lemon Squeezy! Even one-handed! 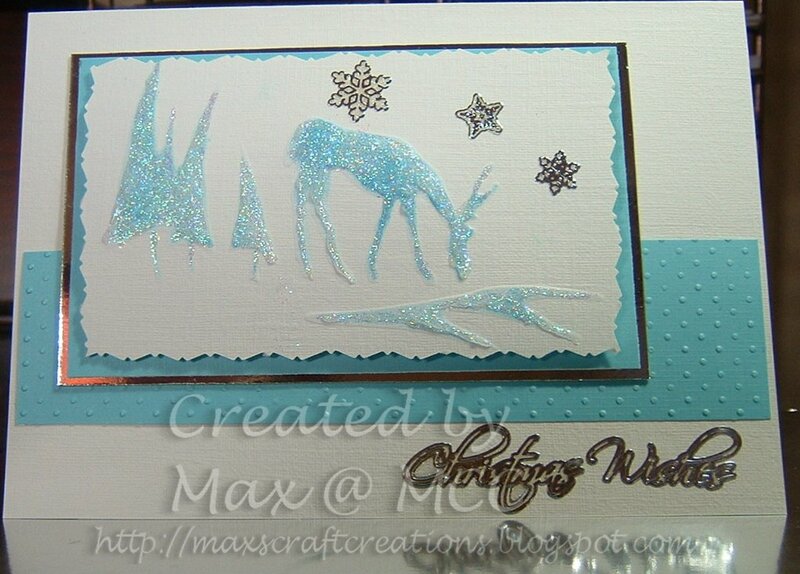 Then I flipped the card and stencil over and inked over the embossed areas with Dew Drop Pearl Sky Blue inkpad. 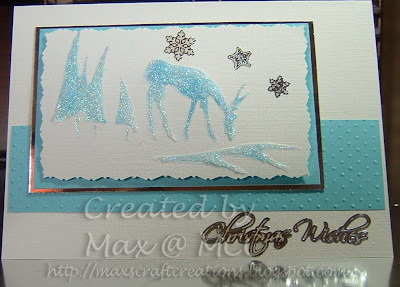 The final touch was going over the design with stickles to add some sparkle. When this dried I cut around the design with decorative scissors and matted it onto blue and then silver card, leaving a narrow border, before adhering the panel slightly to the left of centre, on the card front. A sparkly peel off greeting fills the bottom corner and a trio of matching snowflakes fill the bare space ... and also cover a couple of inky finger marks but don't tell anyone ... tee hee. There are some fabulous stencil projects being shared over at Bah! Humbug, so you should treat yourself to a look ... and if you'd like to join in with us this week, then we'd be more than pleased to see how creative you are with stencils. Now I have to go for a wee lie down as all this one handed typing is quite tiring. Ouch, Max! That is very hard (no, I don't mean the pavement.....) that no one came to help you.....maybe your locality is full of over imbibers of falling down water and they thought you were one of them?! Joking apart, I hope you get better very quickly (and would strongly recommend 1x 500mg tablet of Vitamin C every day, which promotes bone growth). Pretty card - and no possible excuse for the rest of us, is there! Oh No Max, get well soon, What a nightmare for you. How terrible it is that no one stopped to help you. Love the One Handed card. 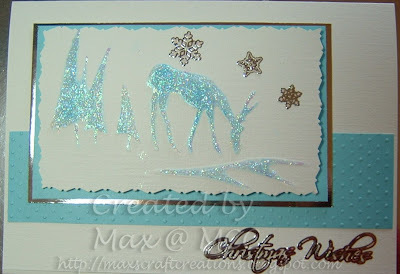 Love what you have done with this card..very pretty colours too ! Well done for making this card with a broken wrist - how bad that no-one came to your rescue though. I hope it soon recovers and isn't too painful in the meantime. Off to look through my stencil collection to see if I have anything seasonal. Remind me not to visit Edinburgh - it's full of really insensitive, unhelpful people by the sound of it.Hope the wrist heals quickly. You'd never guess this card was a one handed effort - it's gorgoues - I love all the sparkly stuff. I am in agreement with everyone else with my disbelief that not a soul came to help you, that is awful. Don't know how you managed to do such a great card but am so glad you did it's really pretty and sparkly. I will have to go away and think about what to do, can't be outdone by a one handed person can I? Keep taking the pain killers and I hope you mend soon. Max I can't believe you managed the shapeboss one handed and made this fab card. Just shows how talented you are. I'm still in shock about you falling - big gentle hugs and tons of love coming your way. No doing too much - you need to get better for spring and the annual Humbuggers meet up. Thank you for all your kind messages. I have been told that the ploy of feigning illness and then robbing people who come to help,is a tactic used by street robbers, so that might explain the reluctance to help ... on the other hand they may have just thought I'd over indulged with 'jolly juice' and so deserved to be lying on the wet pavement lol! Anyway ... it's done now and let's hope it heals properly and speedily with no lasting damage. Im afraid to sday thats what this country is coming to.People dont help these days not even when you fall incase it's a set up!Anyways hopefully it will be slightly less painful.have you got cast on as it just looks like tubi grip?You will be visitng the trauma clinic for few weeks ,hopefully your had wrist will be like new once sorted.Weldone you for making a card too. !Great start to new year hun! I know Jude - it's sad isn't it? It's not a cast like a traditional one, it's called a 'back slab' I think and it's a solid support placed on the arm and wrist which is then covered in wadding and wrapped with bandage to hold in place. Presume it is temporary until they x-ray it again Tuesday. Beautiful card BTW! And one-handed; that's quite a feat! AH Max, i hope you arent in pain! I hope it heals quickly. I offered to help a lady who fell on the ice just before christmas, she went mental at me - saying she could do it herself! I am very shy so that outburst really made me embarrassed! I must admit it puts me off offering help again! I cant believe thats a one handed card its so beautiful, love the glitter! Ouch...my arm hurts just looking at yours. Speedy recovery. Beautiful cards...I'm glad I stopped by.